This is a good simple outdoor effect for parties, barbeques, wintertime or as a nice camera friendly effect for film or video. It's basically a small unit that produces a nice big smokey flame for a surprisingly long time on a single fill of fuel. THIS PROJECT IS ONLY SUITABLE FOR ADULTS WHO FULLY UNDERSTAND THAT FIRE AND HOT FUEL ARE PRESENT! FIRE ATTRACTS CHILDREN LIKE A MAGNET, SO USE EXTREME CARE IN THE PLACEMENT OF THE EFFECT. 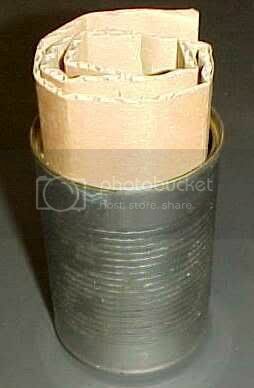 Here's the kit you'll need... An empty food can for use as the container, some cardboard for use as the wick and some liquid paraffin or (kerosene in the USA). Cut the cardboard to a length that allows it to be rolled up and stuffed into the can with at least half an inch sticking up above the can, but not too much. I've actually left the wick a bit too high here. I've used corrugated cardboard here, but ordinary cardboard or paper can be used as long as they can wick fuel up fast enough to sustain a large flame. The components are so cheap and plentiful that you can experiment a lot to find your preffered wick. 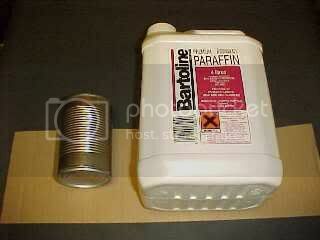 Paraffin is poured into the can up to a maximum of about two thirds of the way up. 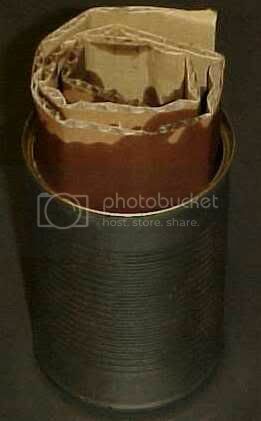 The paraffin will expand a bit with heat, so make sure you leave it well short of the top to avoid spilling. Leave the effect for a while to allow the paraffin to soak up to the top of the wick. I tend to give it at least 15 minutes to ensure that the cardboard is soaked right through. When it's first lit it will flare up to quite a height as the large area of exposed cardboard burns. 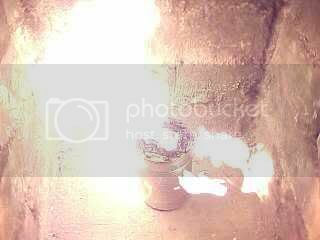 After a while it will settle down to a level at which the flame can be sustained by the fuel wicking speed. The effect should burn continuously for several hours on a modest fill of fuel. DO NOT ATTEMPT TO BLOW THE LIGHT OUT! To extinguish the light safely, use something non-flammable to cap the top. This effect can be enhanced by building it into a suitable prop. I tend to use the cheap cast aluminium post-top garden lanterns which with the top and lampholder removed, make an ornate receptacle for the fuel can. The glass panels should be removed and replaced with sections of metal plate that stop just short of the bottom of the light to allow air to enter at the base.